Wallace of the Week! 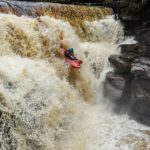 A waterfall leap of faith... | DBP MAGAZINE ONLINE The World's Best Free Whitewater Publication. Our first example is not even involving paddlesports! It does however involve waterfalls, which makes it count! This guy obviously watched some videos of Dane etc and thought that doing it in the kayak was for pussies, so just decided to jump! The impact looks really savage. What is the worst hit you have ever had from boating? Send in your submission for Wallace of the week by messaging the Facebook page!